An Iron Condor is a truly neutral options strategy. It combines two Vertical Credit Spreads, a Bull-Put Credit Spread with a Bear-Call Credit Spread into a four-legged bet that a stock won’t move outside of a certain range. 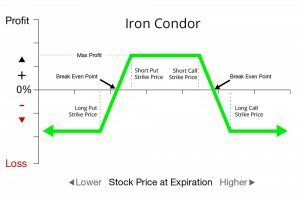 If a Bull-Put spread is a bet that a stock will stay above one price, while a Bear-Call spread bets the stock will stay below another price, you can use an Iron Condor to profit if the stock stays between the two prices. One of the reasons investors like Iron Condors, is that they have the low capital requirements of Vertical Spreads, and potentially, offer even higher returns. Those higher returns are possible because we collect two credits, one for the bullish side, and one for the bearish side, while having slightly less at risk. It’s possible because of the way Vertical Spreads work. Since the amount at risk in a Vertical Spread is the difference in strike prices, less the credit, and an Iron Condor combines two Vertical Spreads, you get two credits. Now, since the stock can’t move outside of our range in both directions, it is only possible for one side or the other of this trade to go bad. This means we can subtract two credits from the strike widths of either of our Vertical Spreads. Imagine we wanted to trade XYZ, which had a price of $50.00. Our bullish vertical spread might be to buy the $45 call and sell the $47.50 call for a credit of $0.50. Our bearish vertical spread might be to buy the $55 call and sell the $52.50 call for a credit of $0.50. Since the strike widths and credits are the same for both of these trades, individually, they have an at-risk amount of $2.50-$0.50 = $2.00) giving them a return of $0.50 / $2.00 = 25%. You can see that combining credits, without adding risk really moves the needle in your favor. An Iron Condor is statistically less likely to return the full profit than either of the two component vertical spreads, but can be a very profitable trade for stocks that are trading in a tight range. To search for Iron Condor trade ideas with a screener use the Trade Idea Generator. Up next: What is a Vertical Credit Spread?